Fort Indiantown Gap, or "The Gap," is located in Lebanon County, Pennsylvania. It is an active National Guard Training Center and the headquarters for the Pennsylvania Department of Military and Veterans Affairs. Major units on base include the 28th Infantry Division, the 213th Area Support Group and the Eastern Army National Guard Aviation Training Site. 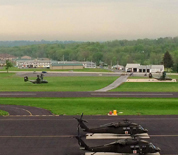 This Fort Indiantown Gap directory features the critical info you’ll need to navigate through the many facilities and recreational opportunities available on base.